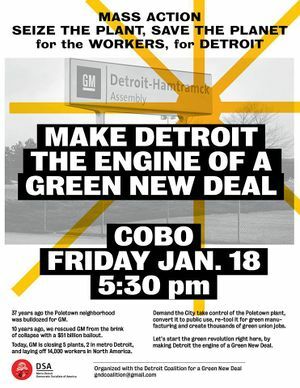 Detroit Coalition for a Green New Deal is based in Michigan. GM recently announced that it plans to close five North American manufacturing facilities, including two inMetro Detroit. This shameful announcement comes at a time when the company is reporting record profits and its CEO,Mary Barra, makes $22 million a year. Meanwhile, as GM proclaims its commitment to a “zero emissions” future, it hasdecided to pull the plug on the hybrid Volt, which is manufactured at the Detroit-Hamtramck plant, so it can focus ongas-guzzling pickup trucks and SUVs. GM has no right to displace over 14,000 workers, their families, and theircommunities. These facilities are not just the “property” of a corporation. They belong to the workers who havecontributed their labor, and the taxpayers who have provided enormous tax breaks, public subsidies, and bailouts to GM. GM must honor its labor contracts and its legal and moral commitments to the places in which it has donebusiness. This means keeping all the plants open, creating more union jobs, and ensuring they contribute to thebuilding of a green economy. If GM does not agree to keep the plants open, we demand that they be seized via eminent domain and put topublic use. If eminent domain was used to take property from the residents of Poletown in the early 1980s to buildthe Detroit-Hamtramck plant, it can be used today to take the assets back. Public hearings on this issue are vital. We demand a Green New Deal that takes us on a path to rapid decarbonization of the economy, implements afederal union jobs guarantee, and ensures a just transition for workers, people of color, the poor, and othermarginalized groups. This page was last modified on 3 February 2019, at 23:56.